The Clog loves tips! 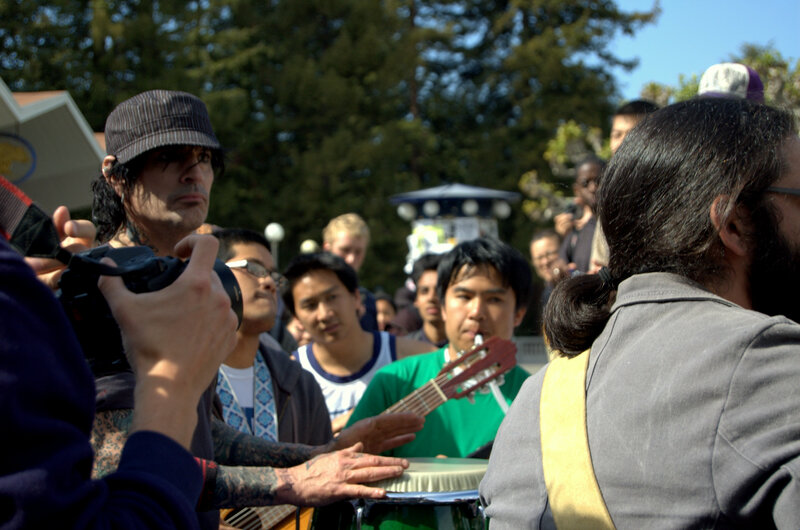 We especially love tips from friends who inform us that Tommy Lee (of Pamela Anderson fame) is jamming with random dudes on Upper Sproul Plaza in the name of the environment. Apparently, Lee was on campus today to film a new reality show for an unknown channel called Planet Green. The show is aptly named “Battleground Earth,” and the premise is quite unusual–Lee and rapper Ludacris (whom Lee affectionately calls “Luda the Polluta”) battle it out to see who can highlight green issues best, using the power of entertainment. We don’t really know how a jam session helped him score points against Luda in the green game–but hey, we kind of liked the dirty melange of noise. Our tipster was actually one of those random dudes on Sproul. Scooters are good for the environment. So is Tommy Lee’s bus–which runs on bio-diesel. Tommy Lee and friends on the corner of Telegraph and Bancroft Avenues deciding what they should do next. Walk down the iconic Telegraph Avenue, perhaps? What about Tommy Lee riding down telegraph in a big garbage truck ? Did you miss that part ?!! It took me a really long time to figure out why everyone was so interested in this ugly truck. It’s surprising to me to find out this was a green project. He circled around telegraph at least 4 times from what i saw, that’s a big waste of fuel and pollution contributer I’m sure… None the less it seemed like a very festive occasion. i saw the blue-tipped hair girl stop an innocent bystander and ask, “are you done with that?” (pointing to a cup of something). obviously, if someone is holding a cup of liquid food, then no- they aren’t done with it, especially if they were sipping out of said cup a minute previous. I didn’t hear the reply, because I felt adversive to the cameras and somehow felt that berkeley was being exploited for it’s reputation of being ‘green’ friendly. i sure hope they don’t give much attention to the tree people. that would be weird. they should go to UCLA. there are practically no recycling receptacles on that campus. my school college trip was there while they were setting up. we were gonna be in the background of the video sitting around the fountain but our teachers made us leave. they were tired of waiting. i saw one crew member have a big wad of fake money and the guys discussing what to do. when i asked the location director why they chose berkeley he said cause it was near where they were doing most of the shooting. Nothing like a modest musician. Douche. Haha! Sorry. I never said I play everything WELL. Besides, these producer people looked pretty goofy, I didn’t feel like being serious with them. But sorry for being a douche! I am a most modest musician, I swear. The Discovery Network and its new offshoot Planet Green have signed on Motley Crue drummer Tommy Lee and rapper Chris “Ludacris” Bridges in their new reality show, Battleground Earth. Ten episodes are planned for production, with the show premiering in late July or early August. The company is rebranding its Discovery Home network as Planet Green, which will debut on June 4.Battleground Earth will show Ludacris and Lee going across the country to compete in challenges that draw attention to green issues, ending with a joint concert at the Greek Theater in L.A. that benefits Griffith Park, which was recently ravaged by wildfires. Both will be on tour with their respective entourages trying to “out-green” the other one. This includes keeping their tour bus, stage acts and more all eco-friendly. that’s hilarious. they really should go somewhere else to promote this green-earth business. god knows berkeley’s got enough ppl recycling! 11:25pm 5/2 Just watched Tommy Lee and Co. filming on Bourbon St. They are running up and down the sidewalk and getting lots of unwanted attention from the drunk/curious tourists. They are having a tough time filming due to all the catcalls and other interruptions. My name’s Johnny Allen Shaw. I’m the creator of “My Big Fat Homeless Berkeley Movie”. While Tommy was here in town filming with the garbage truck, I filmed him having a conversation with my friend, Dan McMullen (Dan’s trying to get Tommy to come back next year and play People’s Park). I got permission (on camera) to use the footage in my upcoming, final installment, “Last Of The Big Fat Homeless Berkeley Movies”, so it looks like he’ll be featured. Also, I had them get some close-up shots of my kiosk with the DVDs on display, figuring that someone might see them in post-production, but the other day, someone told me they saw my DVDs on the Discovery Channel. Me. A nobody. Wow. Everyone was extremely gracious and friendly and, hopefully, we’ll see them again next year. I know Tommy will be interested in seeing my next film when it’s released (to make sure I’m not sandwiching him in-between abusive stuff or putting words in his mouth. Relax — I don’t play it like that) and he may be so amused that he actually ends up coming back and playing the 40th anniversary of People’s Park. It wouldn’t surprise me. What i don’t understood is actually how you’re not really much more well-liked than you might be now. You are so intelligent. You realize thus considerably relating to this subject, produced me personally consider it from so many varied angles. Its like men and women aren’t fascinated unless it’s one thing to accomplish with Lady gaga! Your own stuffs nice. Always maintain it up! I blog often and I really appreciate your content. Your article has truly peaked my interest. I am going to bookmark your website and keep checking for new details about once per week. I subscribed to your RSS feed too.